The term "tuna" ultimately derives from Thunnus, the Middle Latin form of the Ancient Greek: θύννος, translit. (thýnnos), lit. 'tunny-fish' – which is in turn derived from θύνω (thýnō), "rush, dart along". 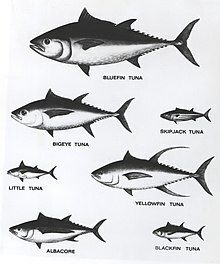 However, the immediate source for the word tuna in English is American Spanish < Spanish atún < Andalusian Arabic at-tūn, assimilated from al-tūn التون [Modern Arabic التن] : 'tuna fish' < Greco-Latin thunnus mentioned above. Cladogram: Tunas are classified into the tribe Thunnini (bottom-center in the above diagram) – one of four tribes in the family Scombridae. The "true" tunas are those that belong to the genus Thunnus. Until recently, it was thought that there were seven Thunnus species, and that Atlantic bluefin tuna and Pacific bluefin tuna were subspecies of a single species. In 1999, Collette established that based on both molecular and morphological considerations, they are in fact distinct species. The genus Thunnus is further classified into two subgenera: Thunnus (Thunnus) (the bluefin group), and Thunnus (Neothunnus) (the yellowfin group). The tuna is a sleek and streamlined fish, adapted for speed. It has two closely spaced dorsal fins on its back; The first is "depressible" – it can be laid down, flush, in a groove that runs along its back. Seven to ten yellow finlets run from the dorsal fins to the tail, which is lunate – curved like a crescent moon – and tapered to pointy tips. The caudal peduncle, to which the tail is attached, is quite thin, with three stabilizing horizontal keels on each side. The tuna's dorsal side is generally a metallic dark blue, while the ventral side, or underside, is silvery or whitish, for camouflage. Thunnus are widely but sparsely distributed throughout the oceans of the world, generally in tropical and temperate waters at latitudes ranging between about 45° north and south of the equator. All tunas are able to maintain the temperature of certain parts of their body above the temperature of ambient seawater. For example, bluefin can maintain a core body temperature of 25–33 °C (77–91 °F), in water as cold as 6 °C (43 °F). However, unlike "typical" endothermic creatures such as mammals and birds, tuna do not maintain temperature within a relatively narrow range. Tunas achieve endothermy by conserving the heat generated through normal metabolism. In all tunas, the heart operates at ambient temperature, as it receives cooled blood, and coronary circulation is directly from the gills. The rete mirabile ("wonderful net"), the intertwining of veins and arteries in the body's periphery, allows nearly all of the metabolic heat from venous blood to be "re-claimed" and transferred to the arterial blood via a counter-current exchange system, thus mitigating the effects of surface cooling. 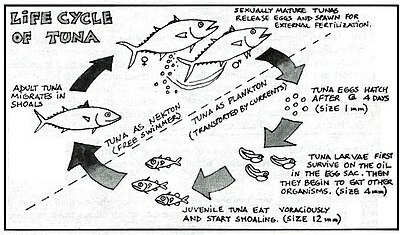 This allows the tuna to elevate the temperatures of the highly-aerobic tissues of the skeletal muscles, eyes and brain, which supports faster swimming speeds and reduced energy expenditure, and which enables them to survive in cooler waters over a wider range of ocean environments than those of other fish. Also unlike most fish, which have white flesh, the muscle tissue of tuna ranges from pink to dark red. The red myotomal muscles derive their color from myoglobin, an oxygen-binding molecule, which tuna express in quantities far higher than most other fish. The oxygen-rich blood further enables energy delivery to their muscles. For powerful swimming animals like dolphins and tuna, cavitation may be detrimental, because it limits their maximum swimming speed. Even if they have the power to swim faster, dolphins may have to restrict their speed, because collapsing cavitation bubbles on their tail are too painful. Cavitation also slows tuna, but for a different reason. Unlike dolphins, these fish do not feel the bubbles, because they have bony fins without nerve endings. Nevertheless, they cannot swim faster because the cavitation bubbles create a vapor film around their fins that limits their speed. Lesions have been found on tuna that are consistent with cavitation damage. Between 1940 and the mid-1960s, the annual world catch of the five principal market species of tunas rose from about 300 thousand tons to about 1 million tons, most of it taken by hook and line. With the development of purse-seine nets, now the predominant gear, catches have risen to more than 4 million tons annually during the last few years. Of these catches, about 68 percent are from the Pacific Ocean, 22 percent from the Indian Ocean, and the remaining 10 percent from the Atlantic Ocean and the Mediterranean Sea. 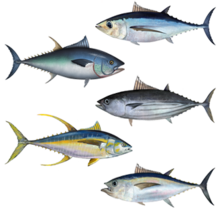 Skipjack makes up about 60 percent of the catch, followed by yellowfin (24 percent), bigeye (10 percent), albacore (5 percent), and bluefin the remainder. Purse-seines take about 62 percent of the world production, longline about 14 percent, pole and line about 11 percent, and a variety of other gears the remainder. The Australian government alleged in 2006 that Japan had illegally overfished southern bluefin by taking 12,000 to 20,000 tonnes per year instead of the agreed upon 6,000 tonnes; the value of such overfishing would be as much as US$2 billion. Such overfishing has severely damaged bluefin stocks. According to the WWF, "Japan's huge appetite for tuna will take the most sought-after stocks to the brink of commercial extinction unless fisheries agree on more rigid quotas". Japan's Fisheries Research Agency counters that Australian and New Zealand tuna fishing companies under-report their total catches of southern bluefin tuna and ignore internationally mandated total allowable catch totals. In November 2011, a different record was set when a fisherman in Massachusetts caught an 881 lb (400 kg) tuna. It was captured inadvertently using a dragnet. Due to the laws and restrictions on tuna fishing in the United States, federal authorities impounded the fish because it was not caught with a rod and reel. Because of the tuna's deteriorated condition as a result of the trawl net, the fish sold for just under $5,000. In 2005, Nauru, defending its vote from Australian criticism at that year's meeting of the International Whaling Commission, argued that some whale species have the potential to devastate Nauru's tuna stocks, and that Nauru's food security and economy relies heavily on fishing. Despite this, Nauru does not permit whaling in its own waters and does not allow other fishing vessels to take or intentionally interact with marine mammals in its Exclusive Economic Zone. In 2010 and 2011 Nauru supported Australian proposals for a western Pacific-wide ban on tuna purse-seining in the vicinity of marine mammals – a measure which was agreed by the Western and Central Pacific Fisheries Commission at its eighth meeting in March 2012. Dolphins swim beside several tuna species. These include yellowfin tuna in the eastern Pacific Ocean, but not albacore. Tuna schools are believed to associate themselves with dolphins for protection against sharks, which are tuna predators. Commercial fishing vessels used to exploit this association by searching for dolphin pods. Vessels would encircle the pod with nets to catch the tuna beneath, however the nets were prone to entangling dolphins, injuring or killing them. Public outcry and new government regulations, which are now monitored by NOAA have led to more "dolphin friendly" methods, now generally involving lines rather than nets. However, there are neither universal independent inspection programs nor verification of "dolphin safeness", so these protections are not absolute. According to Consumers Union, the resulting lack of accountability means claims of tuna that is "dolphin safe" should be given little credence. Fishery practices have changed to be dolphin friendly, which has caused greater bycatch including sharks, turtles and other oceanic fish. Fishermen no longer follow dolphins, but concentrate their fisheries around floating objects such as fish aggregation devices, also known as FADs, which attract large populations of other organisms. Measures taken thus far to satisfy the public demand to protect dolphins can be potentially damaging to other species as well. Increasing quantities of high-grade tuna are reared in net pens and fed bait fish. In Australia, former fishermen raise southern bluefin tuna, Thunnus maccoyii, and another bluefin species. Farming its close relative, the Atlantic bluefin tuna, Thunnus thynnus, is beginning in the Mediterranean, North America and Japan. Hawaiʻi approved permits for the first U.S. offshore farming of bigeye tuna in water 1,300 feet (400 m) deep in 2009. Japan is the biggest tuna consuming nation and is also the leader in tuna farming research. Japan first successfully farm-hatched and raised bluefin tuna in 1979. In 2002, it succeeded in completing the reproduction cycle and in 2007, completed a third generation. The farm breed is known as Kindai tuna. Kindai is the contraction of Kinki University in Japanese (Kinki daigaku). In 2009, Clean Seas, an Australian company which has been receiving assistance from Kinki University managed to breed Southern Bluefin Tuna in captivity and was awarded the second place in World's Best Invention of 2009 by Time magazine. The fresh or frozen flesh of tuna is widely regarded as a delicacy in most areas where it is shipped, being prepared in a variety of ways for the sake of achieving specific flavors or textures. One way that fresh tuna is served is in sushi. When served as a steak, the meat of most species is known for its thickness and tough texture. In the UK, supermarkets began flying in fresh tuna steaks in the late 1990s, which helped to increase the popularity of using fresh tuna in cooking; by 2009, celebrity chefs regularly featured fresh tuna in salads, wraps, and char-grilled dishes. Fresh bluefin is considered a "cultural institution in Japan and there is still an enormous demand for this delicacy" at restaurants. When tuna is canned and packaged for sale, the product is sometimes called tuna fish. Canned tuna was first produced in Australia in 1903, quickly becoming popular. Tuna is canned in edible oils, in brine, in water, and in various sauces. Amanda Shapiro of Bon Appetit recommends oil-packed tuna, as it "seals in flavor and gives you some luxurious fat", and she favors olive oil-packed product. Tuna may be processed and labeled as "solid", "chunked" or "flaked". When canned, the product is often referred to as "tuna fish", a calque (loan translation) from the German Thunfisch. Canned tuna may be nicknamed "chicken of the sea". In the United States, 52% of canned tuna is used for sandwiches; 22% for tuna salads; and 15% for tuna casseroles and dried and prepackaged meal kits, such as General Mills's Tuna Helper line. Other canned tuna dishes include tuna melts (tuna mixed with mayonnaise, served on bread with cheese melted on top); salade niçoise, a salad made of tuna, olives, green beans, potatoes, hard-boiled eggs and anchovy dressing; and tuna burgers, which are served on buns. Depending upon the color of the flesh of the tuna species, the can is marked as "light" or "white" meat, with "light" meaning a greyish pink color and "white" meaning a light pink color. In the United States, only albacore can legally be sold in canned form as "white meat tuna"; in other countries, yellowfin is also acceptable. While in the early 1980s canned tuna in Australia was most likely Southern bluefin, as of 2003[update] it was usually yellowfin, skipjack, or tongol (labelled "northern bluefin" or "longtail"). As tunas are often caught far from where they are processed, poor interim conservation can lead to spoilage. Tuna is typically gutted by hand, and later pre-cooked for prescribed times of 45 minutes to three hours. The fish are then cleaned and filleted, canned, and sealed, with the dark lateral blood meat often separately canned for pet food. The sealed can is then heated under pressure (called retort cooking) for 2 to 4 hours. This process kills any bacteria, but retains the histamine that may have been produced by those bacteria. The international standard sets the maximum histamine level at 200 milligrams per kilogram. An Australian study of 53 varieties of unflavored canned tuna found none to exceed the safe histamine level, although some had "off" flavors. Australian standards once required cans of tuna to contain at least 51% tuna, but these regulations were dropped in 2003. The remaining weight is usually oil or water. In the US, the Food and Drug Administration (FDA) regulates canned tuna (see part c). 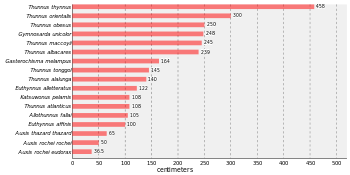 Mercury content in tuna can vary widely. Among those calling for improved warnings about mercury in tuna is the American Medical Association, which adopted a policy that physicians should help make their patients more aware of the potential risks. A study published in 2008 found that mercury distribution in the meat of farmed tuna is inversely related to the lipid content, suggesting that higher lipid concentration within edible tissues of tuna raised in captivity might, other factors remaining equal, have a diluting effect on mercury content. Due to their high position in the food chain and the subsequent accumulation of heavy metals from their diet, mercury levels can be high in larger species such as bluefin and bigeye. Mackerel tuna is one species of tuna that is lower in mercury concentration than skipjack or yellowfin, but this species is known as "black meat" or "dark meat" tuna, which is a lower grade for canning because of the color, unfavorable flavor, and poor yield. In March 2004, the United States FDA issued guidelines recommending that pregnant women, nursing mothers, and children limit their intake of tuna and other predatory fish. The Environmental Protection Agency provides guidelines on how much canned tuna is safe to eat. Roughly speaking, the guidelines recommend one 6-ounce (170 g) can of light tuna per week for individuals weighing less than 110 pounds (50 kg), and two cans per week for those who weigh more. In 2007 it was reported that some canned light tuna such as yellowfin tuna is significantly higher in mercury than skipjack, and caused Consumers Union and other activist groups to advise pregnant women to refrain from consuming canned tuna. In 2009, a California appeals court upheld a ruling that canned tuna does not need warning labels as the methylmercury is naturally occurring. A January 2008 report revealed potentially dangerous levels of mercury in certain varieties of sushi tuna, reporting levels "so high that the Food and Drug Administration could take legal action to remove the fish from the market." The main tuna fishery management bodies are the Western and Central Pacific Fisheries Commission, the Inter-American Tropical Tuna Commission, the Indian Ocean Tuna Commission, the International Commission for the Conservation of Atlantic Tunas, and the Commission for the Conservation of Southern Bluefin Tuna. The five gathered for the first time in Kobe, Japan in January 2007. Environmental organizations made submissions on risks to fisheries and species. The meeting concluded with an action plan drafted by some 60 countries or areas. Concrete steps include issuing certificates of origin to prevent illegal fishing and greater transparency in the setting of regional fishing quotas. The delegates were scheduled to meet at another joint meeting in January or February 2009 in Europe. In 2010, Greenpeace International added the albacore, bigeye tuna, Pacific bluefin tuna, Atlantic bluefin tuna, southern bluefin tuna, and yellowfin tuna to its seafood red list, which are fish "commonly sold in supermarkets around the world, and which have a very high risk of being sourced from unsustainable fisheries." Bluefin tuna have been widely accepted as being severely overfished, with some stocks at risk of collapse. According to the International Seafood Sustainability Foundation (a global, nonprofit partnership between the tuna industry, scientists, and the World Wide Fund for Nature), Indian Ocean yellowfin tuna, Pacific Ocean (eastern and western) bigeye tuna, and North Atlantic albacore tuna are all overfished. In April 2009, no stock of skipjack tuna (which makes up roughly 60% of all tuna fished worldwide) was considered to be overfished. However, the BBC documentary South Pacific, which first aired in May 2009, stated that, should fishing in the Pacific continue at its current rate, populations of all tuna species could collapse within five years. It highlighted huge Japanese and European tuna fishing vessels, sent to the South Pacific international waters after overfishing their own fish stocks to the point of collapse. A 2010 tuna fishery assessment report, released in January 2012 by the Secretariat of the Pacific Community, supported this finding, recommending that all tuna fishing should be reduced or limited to current levels and that limits on skipjack fishing be considered. Research indicates that increasing ocean temperatures are taking a toll on the tuna in the Indian Ocean, where rapid warming of the ocean has resulted in a reduction of marine phytoplankton. The bigeye tuna catch rates have also declined abruptly during the past half century, mostly due to increased industrial fisheries, with the ocean warming adding further stress to the fish species. ^ a b c Graham, Jeffrey B.; Dickson, Kathryn A. (2004). "Tuna Comparative Physiology". The Journal of Experimental Biology. 207 (23): 4015–4024. doi:10.1242/jeb.01267. PMID 15498947. ^ a b c Collette B and 8 others (2011). "Thunnus maccoyii". IUCN Red List of Threatened Species. Version 2014.3. International Union for Conservation of Nature. Retrieved 9 January 2015. CS1 maint: Uses authors parameter (link) "This species has been intensively fished since the early 1950s. Its generation length is conservatively estimated to be 12 years. Estimated spawning stock biomass has declined approximately 85% over the past 36 years (1973–2009) and there is no sign that the spawning stock is rebuilding. It is therefore listed as Critically Endangered. Implementation of effective conservation and management measures are urgently needed." ^ Collette, B.B. (1999). "Mackerels, molecules, and morphology". In Séret, B.; Sire, J.Y. (eds.). Proceedings. 5th Indo-Pacific Fish Conference: Nouméa, New Caledonia, 3–8 November 1997. Paris: Société Française d'Ichtyologie [u.a.] pp. 149–164. ISBN 978-2-9507330-5-4. ^ Tanaka, Y.; Satoh, K.; Iwahashi, M.; Yamada, H. (2006). "Growth-dependent recruitment of Pacific bluefin tuna Thunnus orientalis in the northwestern Pacific Ocean". Marine Ecology Progress Series. 319: 225–235. doi:10.3354/meps319225. ^ a b c Sepulveda, C.A. ; Dickson, K.A. ; Bernal, D.; Graham, J.B. (1 July 2008). "Elevated red myotomal muscle temperatures in the most basal tuna species, Allothunnus fallai" (PDF). Journal of Fish Biology. 73 (1): 241–249. doi:10.1111/j.1095-8649.2008.01931.x. Archived from the original (PDF) on February 7, 2013. Retrieved 2 November 2012. ^ a b Landeira-Fernandez, A.M.; Morrissette, J.M. ; Blank, J.M. ; Block, B.A. (16 October 2003). "Temperature dependence of the Ca2+-ATPase (SERCA2) in the ventricles of tuna and mackerel". American Journal of Physiology. Regulatory, Integrative and Comparative Physiology. 286 (2): R398–R404. doi:10.1152/ajpregu.00392.2003. PMID 14604842. ^ Balshaws, S.; Edwards, J.W. ; Ross, K.E. ; Daughtry, B.J. (December 2008). "Mercury distribution in the muscular tissue of farmed southern bluefin tuna (Thunnus maccoyii) is inversely related to the lipid content of tissues". Food Chemistry. 111 (3): 616–621. doi:10.1016/j.foodchem.2008.04.041. ^ a b Roxy, Mathew Koll; Modi, Aditi; Murtugudde, Raghu; Valsala, Vinu; Panickal, Swapna; Prasanna Kumar, S.; Ravichandran, M.; Vichi, Marcello; Lévy, Marina (2016-01-28). "A reduction in marine primary productivity driven by rapid warming over the tropical Indian Ocean". Geophysical Research Letters. 43 (2): 2015GL066979. doi:10.1002/2015GL066979. ISSN 1944-8007.